Quebrada de Humahuaca (named by the Inca descendents of northern Argentina) is a narrow valley just south of the Bolivian border. 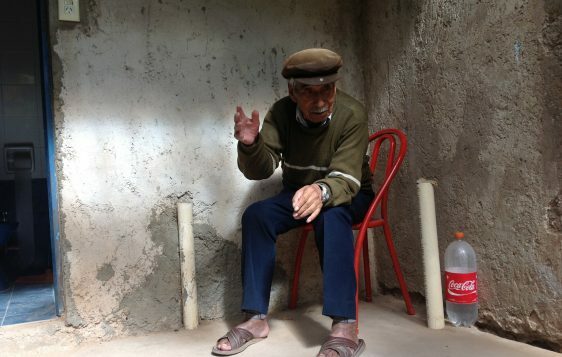 Vicente has over ninety years of experience living in this area and its difficult terrain. As a shepherd he has experience with the snowy mountains which are home to pumas, lions, and snow leopards. It was this experience that prepared him for the trek that would change his life and his family tree forever. Like many men in his province, Vicente was a drunk, and one particular morning his wife awakened and sorrowfully told him that life could not continue on the same path. In an effort to appease his wife and desperately try to change their sad situation, Vicente struck out over the mountains for a full day of travel in search of a man who possessed information that changed lives, or so he had heard. On the second day of his journey he found the man who told him about the Son who has that power. In the years that followed, Vicente, his wife and their small children made the same journey over the hills and mountains, a day’s journey each way, to learn more about God’s Son and his Word. It was Bro. David Dickson, BMA missionary and leader in South America, who first heard Vicente’s story of redemption from Vicente’s son, Alberto Lopez, who is now the pastor the of Casa de Oración (House of Prayer), a BMA church in Humahuaca. All of Bro. Vincente’s children and some of his grandchildren serve the Lord in some capacity in the Humahuaca region and in other areas of Argentina. Vicente’s descendants are now changing lives in their communities. It was in March of 2015 during Carnivale (a seven-day festival with dancing, drinking, worshipping, and offering sacrifices to idols, gods, goddesses, saints, the sun, and the devil himself) that Pastor Alberto, Bro. Vicente, his family and church dedicated House of Prayer, a lighthouse and beacon to the community. It is the tallest building in the area and there is a Lifeword Community Radio transmitter attached to it. The church uses LCR (Lifeword Community Radio) to minister to a community of people caught up in the aforementioned pagan rituals. In addition, young people in the area struggle with suicide, abortion and drugs. Vicente’s despair and his quest for hope led him to the Lord decades before, and because of his faithfulness, an entire area can now hear the gospel through Lifeword Community Radio. Many Argentine Aborigines believe that Jesus is the European or white man’s God, but many have received him and he is their Savior. Pray that many more will find the hope found in Jesus and his cross.